Starbucks workers and baristas are required to provide excellent customer service by taking orders and making hot and cold beverage, sandwiches, and desserts including coffee, teas, and specialty drinks. The worker must also complete the transaction using the cash register and credit/debit card machine. All workers are required to field customer questions, concerns and complaints while ensuring the coffee shop, preparation area, machines and restrooms remained clean during their shift. All orders must be provided to the customer promptly. Baristas – These workers are hands-on in a Starbucks coffee shop by handcrafting beverages according to the company’s menu. Shift Supervisors – These workers provide operational guidance to baristas by managing their shift, making operational decisions, running the barista team while delivering optimal customer service. Shift Managers – Some Starbucks coffee shops hire shift managers to maintain an orderly environment and oversee operations by directing shift Supervisors and baristas. Assistant Store Managers – After completing a rigorous year-long training program, and Assistant store manager guides shift managers and shift Supervisors using coaching skills, supervisory experience, and business acumen. Store Managers – In this position, the manager runs the entire operation of the store including overseeing Assistant store managers, shift managers, supervisors, and baristas. Newly hired employees are provided a training booklet and education from a learning coach on how to use effective tools to create perfectly-designed hot and cold beverages. In addition, the worker is trained on how to use the cash register to complete the sales transaction. The barista is required to memorize drink items and learn how to explain the beverage to the consumer. This requires memorize and specifications and ingredients and how to make any modification requested by the customer. 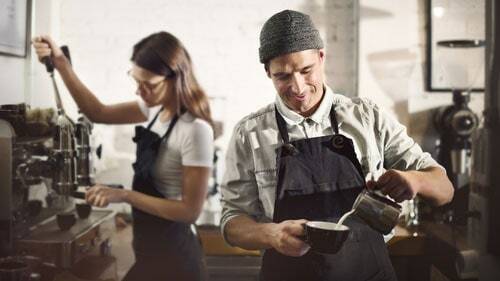 If you or a family member was injured while working at Starbucks, you are likely entitled to workers compensation benefits. Contact the workers compensation attorneys at Rosenfeld Injury Lawyers LLC for more information and a free review of your legal rights and options. While working as a barista or coffee specialists at a Starbucks shop can be a rewarding experience, the fast-paced environment, and high-volume sales can generate overexertion and fatigue. Workers often perform repetitive movements throughout the day that affect their mental and physical health in numerous negative ways. These injuries are often the result of stamping the expresso handle, turning knobs, and manipulating the machinery to create the ideal perfect beverage. Repetitive Stress Injury (Repetitive Motion Injury – RMI) – The most common injury suffered by Starbucks coffee worker’s is referred to as “barista wrist" or medial epicondylitis or “tennis elbow" caused by repeatedly lifting heavy pitchers of cream and milk, and operating complex machinery. Carpal Tunnel Syndrome – Many baristas retire from their job after being diagnosed with carpal tunnel syndrome, where the repetitive motion of their arm and hand inflames the nerves that run through the wrist. Carpal tunnel syndrome causes specifics symptoms including tingling or numbness in the fingers and hands. Customer Harassment – At some point, most Starbucks workers will be challenged attempting satisfy an impatient customer who wants a complicated coffee order and becomes agitated because their specialty coffee is not quite right. Other workers deal with borderline stalking from patrons who make their sexual interest or personal attraction known to the barista behind the counter. Heavy Lifting Injuries – Most of the products and merchandise delivered from the warehouse arrive in large packaged containers and heavy boxes that require lifting to be stocked or stored in the appropriate place. Without receiving or following heavy lifting training, the worker can seriously injure their back, hips, and neck, shoulders and legs that might result in a lifetime of chronic pain. High Anxiety – In many incidences, working at Starbucks is the employee’s first place of employment. The fast-paced and never-ending demand to keep the line moving can cause physical problems and mental effects including high anxiety, insomnia, mood irritability, elevated levels of stress, and difficulty in interacting with others. Going to Work Sick – Many Starbucks workers go to work when ill because they are not provided health insurance as a part of their benefits package. The lack of access to quality healthcare combined with the lower wages Starbucks pays can create long-term health problems and consequences. Additionally, going to work with a contagious disease can place the health and well-being of co-workers in jeopardy. Many of the common hazards involving physical labor are the result of making espresso using the portafilter that routinely needs to be inserted and removed. The action is typically followed by lifting heavy milk bottles, handling steaming milk, and completing the drink while standing for extended periods. Many employees suffer work-related injuries that qualify them for worker’s compensation coverage. Starbucks workers are often the victims of violent acts caused by agitated customers. Others are killed during coffee shop robberies or face the legal ramifications of being sued for negligent actions that occur while they were on the job. Below is just a small sample of Starbucks cases in the news. Case 1: Georgetown, Washington DC – Three Starbucks workers employed at the Wisconsin Avenue coffee shop were fatally shot in the manager’s office just after the shop closed in July 1997. The bodies were discovered when another worker arrived to open the shop early the next morning. The incident occurred in an affluent neighborhood. The perpetrator is thought to be a disgruntled former worker who have been recently fired at the location. Case 2: Toronto, Ontario – A Canadian teenager is suing a Starbuck’s barista, the store manager, and the coffee shop corporation after an employee poured hot water in the customer’s hands. The March 14, 2015 incident left the then 14-year-old teenager with permanent, severe injuries after asking the barista to fill a baby bottle using warm water. The plaintiff’s court documents state that the employees and the coffee shop corporation “failed to take reasonable or any care at all to ensure that the plaintiff… would be reasonably safe while attending Starbucks." The document states that the company and employees failed to “prevent an injury to [the plaintiff] about which they knew or ought to have known." Case 3: Park Ridge, California – A Starbuck’s customer berated a coffee shop barista that led to a bloody exchange in June 2017. While there were no serious injuries, the Park Ridge Deputy Police Chief stated that “it was an argument that when very wrong." The customer was not happy that the barista made his drink order wrong and took to “hollering at and berating" the worker before a 28-year-old customer came to the defense of the coffee shop worker. An escalation occurred between the two customers that ended in a fight involving a small pocketknife. Case 4: Crystal Lake, Illinois – A Starbucks employee was severely injured with burns to her neck and face. A 28-year-old homeless man from McHenry County was arrested and charged with throwing a hot cup of coffee in the worker’s face. The incident occurred just after 7:00 AM in November 2009 when the man walked into the Starbucks demanding coffee and the role. Police describe his behavior as agitated and irrational. When the clerk attempted to calm the man down, he threw hot coffee in her face before knocking items off the Starbucks counter. First responders transported the employee to the local hospital where she received treatment for first and second-degree burns to the upper body and face. Case 5: Queensland, Australia – A Starbucks worker failed to win monetary compensation for a purported work-related knee injury. An employer/employee dispute handled in a Queensland district court held for the defendant – Starbucks – after the plaintiff failed to say that the injury to her right knee allegedly sustained while working at Starbucks as a barista caused her significant harm. The court documents state that the employee was injured after crouching down on her right foot and left knee to plug in a power cord underneath the bench. At that point, the plaintiff states that she “suffered an acute injury to her right knee." However, the court ruled against the plaintiff in the liability and negligence case. Some injured Starbucks workers have filed lawsuits and claims against the corporate coffee giant to obtain financial compensation to recover their damages. However, these cases are often extremely complex and require the skills of a personal injury attorney who specializes in occupational injuries. 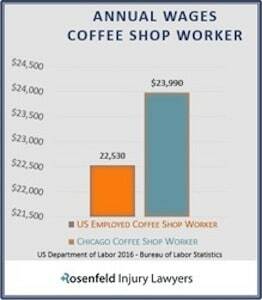 Our attorneys help injured Starbucks Workers obtain monetary recovery under the IL Worker’s Compensation Act and through civil lawsuits. Rosenfeld Injury Lawyers (888-424-5757) provides Free Case Reviews and a No-Win/No Fee Guarantee. Our team of dedicated attorneys can cut the red tape, file necessary paperwork before deadlines, and handle your workplace injury case to ensure your family is adequately compensated for your injuries. We can handle your Worker’s Compensation claim to ensure you receive substantial benefits and help determine if additional parties are also at fault for your harm. Working on your behalf, your attorney can issue a complaint, file your compensation claim, gather evidence, build your case, and negotiate an out of court settlement or take your lawsuit to trial. You won’t need to make any upfront payment for legal services because our personal injury law firm accepts all compensation cases through contingency fee agreements. This arrangement postpones all legal fees until after the attorneys have successfully resolved the case through a negotiated out of court settlement or a jury trial award. We guarantee that if we do not win, you do not pay!